Please welcome Kathy to the blog today! Kathy is sharing her knowledge about some of the best graphic organizers to use in a social studies classroom. Enjoy and gather some new ideas! Graphic organizers are an effective tool to use in the social studies classroom. They organize and communicate information in a visual way. When applied to content areas, graphic organizers enhance the learning and comprehension of difficult concepts and ideas. Using graphic organizers in the Social Studies classroom helps to make content accessible to all levels of learners. 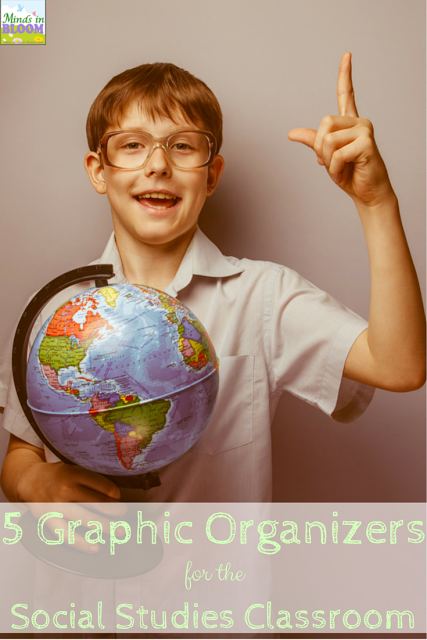 Here are five essential graphic organizers to use in the social studies classroom. This is a great way to review content and vocabulary at the end of a unit. Begin by handing out an ABC chart to the students. Ask students to individually brainstorm as many words and phrases as they can and record them on the chart. After five minutes, instruct students to get up and talk to as many classmates as they can. Tell them to record their classmates’ words on the chart, as well. This is an essential step because it gets students actively engaged and talking about vocabulary. It also helps students remember words they may have missed. Usually, there are meaningful discussions around the vocabulary at this stage in the activity. After a few minutes, send the students back to their seats. From here there are many possibilities: Guide a class discussion on the various words, have students categorize the words into groups and explain why they are grouped together, use five to ten words in sentences, or use words in a writing assignment, just to name a few. Grapes stands for Geography, Religion, Achievements, Politics, Economics, and Social Structure. This is a great way to preview a unit with students by creating a synopsis with them on the upcoming civilization. 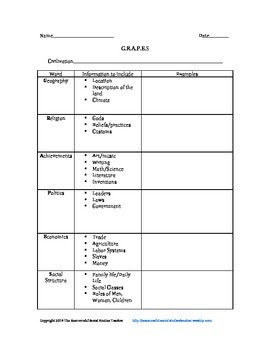 The GRAPES graphic organizer can also be used as a summative assessment. Students can bullet the information they have learned and then turn it into a summary writing assignment. You can get a free copy at my TpT store, The Resourceful Social Studies Teacher. Venn diagrams are a tried-and-true graphic organizer to compare and contrast items in social studies. 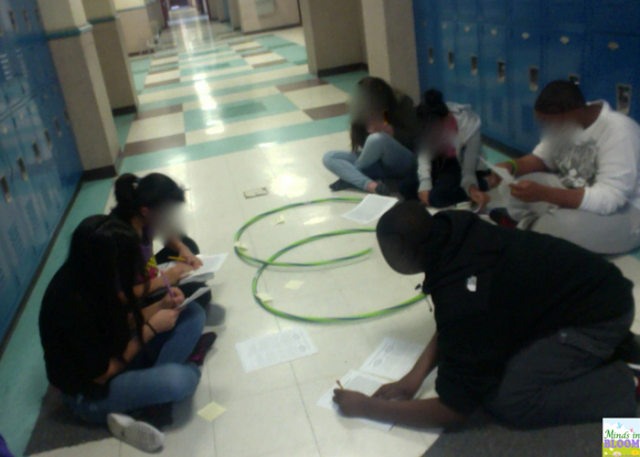 A new twist on an old trick is using hula hoops and sticky notes to create large Venn diagrams. This allows small groups of students to work together to compare and contrast two concepts. Once again, students can engage in meaningful conversations, further solidifying their understanding of the concepts. Recording information about an event in history can be as easy as the Five W’s and an H. It is a great graphic organizer to be using to summarize historical information. Who was involved? What happened? Where did the event happen? When did it happen? Why did it happen? And, of course, how did it happen? This chart is can be found on several educational sites for free or for a small fee on Teachers Pay Teachers. One important skill in a history class is to be able to understand and analyze primary source documents. To do this, a document analysis sheet is needed. When looking at a primary source to analyze, there are several things to consider. Begin with looking at the source. Who wrote it? When was it written? Where? What kind of primary source is it? After that, you should look at the context. What was happening at the time that the document was written? What is the main idea of the document? Who was the document’s intended audience? You can find my Document Analysis Sheet here. I am a soon to be empty-nester with two boys, a husband, and a passion for writing, creating, and teaching. I teach 7th and 8th grade social studies in Massachusetts. I am a self-proclaimed history geek and proud of it! In my spare time (spare time, ha ha–that’s a joke! ), I enjoy photography, reading, and hanging out with my family. Please follow my blog The Resourceful Social Studies Teacher or visit my TpT store. Thank you for your ideas. I have been teaching English as a second language for more than 20 years. I appreciate the new spins on old organizers. I need to keep myself fresh or I will have a nervous breakdown.